Ask two horse people, get three opinions, right? Everyone’s got their favorite stuff for use around the barn. I’m especially picky and I’ll often burn through several possibilities to get just the right thing for my problem. With that in mind, I’m going to do occasional product reviews of things that I’ve used and loved for years. None of these are endorsed unless I mention it up front. I’ve talked a little bit about our recent struggles with white line disease in both of Tristan’s back feet. I’ve been paying too much close attention to his front and it wasn’t until he started chipping excessively in the back that I took a neurotically close look at his hind feet and bam – clear indications of white line problems. I was first introduced to White Lightning by a barefoot trimmer that I loved, who worked on Tristan for about a year and was a friend of my first trimmer in Vermont. She recommended it for a touch of thrush that he had going on at the time. Since then, I’ve always kept a bottle on hand. I tend to think of it as big guns: it can be a pain to apply and use, but whoo boy does it live up to its labeling. The gist is that White Lightning is a chemical that reacts with vinegar to produce chlorine dioxide. For small, short applications such as the mild thrush that first led me to the product, you can mix equal parts White Lighning and vinegar in a spray bottle and then thoroughly spray the bottom of the hoof. It needs to be mixed new each time, as the chemical reaction is what counts. You don’t need much at all if you’re using this method – just 2-3 tablespoons of each liquid. For bigger stuff such as a whole-hoof treatment for persistent thrush or white line disease, you need to get more involved. Clean the whole hoof – even powerwash it if necessary – but the idea is to give the stuff access to all the problem areas. 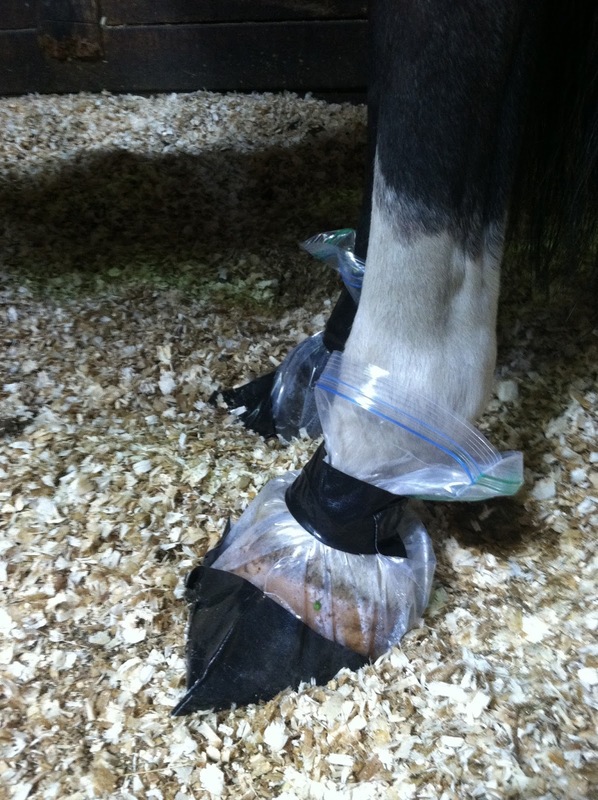 Mix equal parts White Lightning and vinegar, and then the whole hoof needs to be soaked in an airtight bag for 45 minutes. White Lightning recommends 2 oz of the stuff to 2 oz of vinegar, or about enough to get a little ways up above the hoof wall. It really works. It knocks stuff out cold. For really persistent problems my strategy is to soak at 1 week intervals but I promise you will notice a difference, especially if you keep things at an even keel in the interim – stay on top of picking the feet out, etc. Caveat: many people find that their horse’s hair can be bleached by the gas that the mixture produces. I’ve never run into this problem but I’m sure it’s possible.